A considerable amount of time ago, I finally got around to watching the series that everyone was going ballistic over in Iron Blooded Orphans. My experiences in anime for Gundam were limited to an occasional episode of Gundam Wing here and there growing up and watching half of Unicorn last year before losing interest in that particular story. Where I did keep a ton of interest, however, was in building Gunpla (models of Gundam) despite not watching a bulk of the shows they were from. After FunimationNow made the entire dub of Iron Blooded Orphans available for streaming, I binged the whole thing in an off week I had from work and school. When it was all said and done, I had a wide range of feelings about the entire adventure. I found myself ranging in reflection from being disappointed by the hype all the way up to agreeing that it was well worth all of the hype. The action stayed consistently fast paced and unforgiving, the politics were less dry than other Gundam series were before it, and there were a few moments I did not see coming. Unfortunately, I found a blinding amount of the second season to be disappointingly cliché in execution and a few of the characters were really missed with their development. Typically I wouldn’t knock a series for trying to do such a thing, but one character in particular simply devolves into a child throwing a tantrum and it undermines a season and three fourths of development. Without getting into spoiler territory just yet, I’ll just say that the outcome for things in the main group of titular orphans felt completely avoidable and I can’t help but to argue that the justification that “they were young and stubborn” really doesn’t make a lot of sense. With that said, I don’t think this is a crippling demerit, just one that is noteworthy since the writing really carried the series in the first season especially. Now if I haven’t lost the audience with my gripes out of the way, I’d like to dig into what I really appreciated from the second season of this series. It wouldn’t be an article by me without me getting way to sentimental, so to do that I am going to have to cross over into SPOILERS (this is for you, one guy who comments on all of my articles I forget to put the spoiler banner in bold font. It’s all love though bud). Early on in the second season, we are introduced to Vidar, a mysterious man who is obviously Gaelio Bauduin has motives to strangle McGillis before Chris Hansen gets an opportunity to get him on the next episode of To Catch a Predator that are unknown. It is probably worth noting that I might be flying into this a little biased since I had previously built the model for both the Gundam Vidar and Kimaris Vidar but seeing his Gundam teased in just about every episode involving him built up a ton of anticipation for the ensuing action. This purpose alone would have made his character enjoyable (albeit not that deep), but there is a particular plotline that develops and is resolved in a very impressive display of “show, don’t tell” writing prowess. 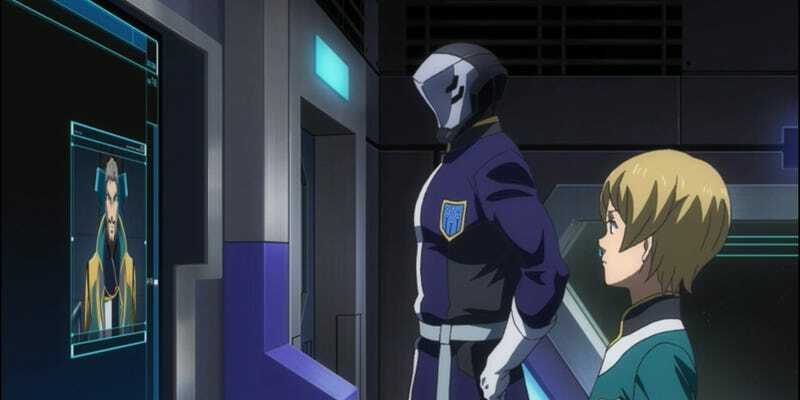 One of the character narratives that is focused on when Gjallarhorn is being shown throughout the second season of IBO is that of Julieta Juris, a young up and coming officer who is desperate to prove her place in Gjallarhorn. Initially, she comes off as pretty one dimensional, being bratty and throwing fits until she is allowed to go on missions, but it isn’t until there is some character interaction with Vidar that we see some noticeable development. Between missions and lulls in the story, Julieta sharply questions Vidar about his intentions and interest in everyone on board their fleet. Vidar calmly responds to all of these inquiries, but it isn’t until he starts taking a mentorship approach to young Julieta that things get interesting. While it is a little more on the nose than the rest of their development, Vidar compares the young officer to “someone (he) once knew”. This someone, as many guessed correctly, was a subordinate he had in the first season named Ein. Ein was obsessed with sacrificing life and limb for the Gjallarhorn cause and, as a result, did just that when he was transformed into a grotesque weapon at the climax of the first season. Vi- I mean Gaelio tried to briefly talk him out of such ideals, but he didn’t follow up with him on this. Simply put, he failed him as a leader. His family’s status and his accompanying rank blinded him from elements of mentorship, leadership, and overall judgement of character that would have alerted him to the issues Ein had. Fast forward to his time as Vidar at this point in the story- he is stoic and scarred from being nearly killed like the rest of his family (or rather, the ones not being lured into a van with candy). For all intensive purposes, he has lost everything that was immediately recognizable as his character and is lunged into a tough position of deciding where to go from there. Along comes a young officer with similar drive as those he saw in his recently deceased subordinate. In many ways, it isn’t far cry to say that he was probably grappling with deciding how to properly approach his mentorship of Julieta. On the exterior, we simply hear a smooth voice with a cool digital filter because that is how masks work and we don’t ever get to see a peek into that noggin of his (after all, the story is still selling us on Vidar being enigmatic and not Gaelio). As he goes along with mentoring Julieta, he starts to try to steer all of that energy and determination for their common cause into being completed off of the officer’s own validation and not from the alluring power of the Gundam. As most warnings go, Julieta does not listen and still tries to force her way through challenges, being beaten to near death in a battle with Tekkadan in the process. Where Vidar finally gets through to her, however, is when she decides against getting a similar treatment done to her that Ein had. She rallies her own internal strength and vows to best her enemies with her own strong willpower alone. It is through this mentorship that Gaelio finds it in himself to rally back from his personal hell, too. Making amends for his failures as a leader and putting to rest the guilt he likely felt for losing Ein, he follows through and shows the world his face again. Vidar is no longer, and Gaelio (successfully) carries out his vengeance against McGillis with his own name. All the meanwhile, Julieta leads the assault (if you don’t count the rain of missiles that came first) that eventually breaks Tekkadan. I think there is a mentorship/leadership role that doesn’t often get conveyed the correct way in media, particularly those with militarized elements to stories. Sometimes a story might make a push for mentorship, but it comes off incredibly forced and obvious results (Mentor says: “You need to do this!” and person being mentored says:“I am doing this now! I am better now because you told me to do this!”). What I loved so much about the characters of Vidar and Julieta is that they developed without a lot actually being said between the duo. Vidar said what he needed to, but it wasn’t in the viewer’s face. Julieta did a lot of off screen reflection and there wasn’t anything typical of anime like inner thoughts or horrendous retelling of lessons. This writing respected the audience to see these developments and, as a result, it is easier to appreciate this writing. Mentorship is a two way street too. By helping another, one offers themselves a wealth of opportunity to grow themselves. It is through these kinds of interactions that we can grow as leaders, parents, friends, and family.